This second installment of the frequencies series created by Nicolas Bernier (winner of PrixArs Electronica 2013 Golden Nica in Digital Musics and Sound Art) is an audiovisual composition purely based on digital synthetic sounds. 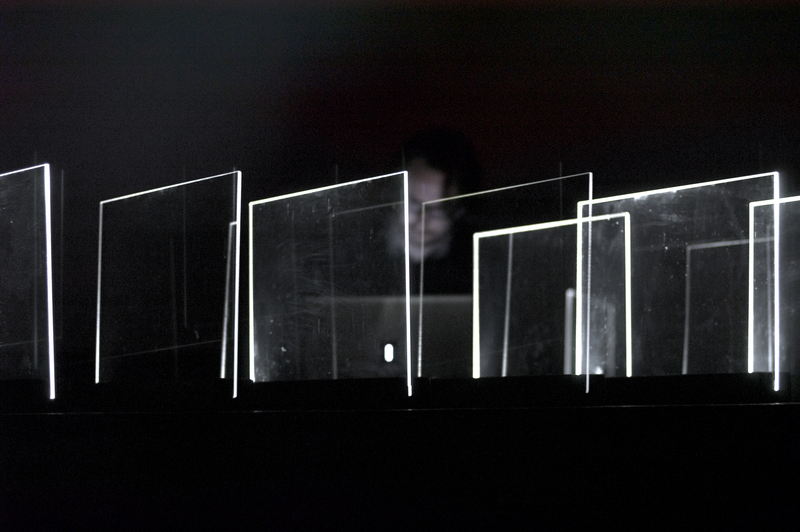 The performance is built of short sequences that the performer is organizing and processing in real time. Sound and light bursting within small acrylic structures have been tightly composed together, both sharing a sense of extreme precision where one can either hear the light or see the sound. Nicolas Bernier creates sound performances, installations, musique concrète, live electronics, post-rock, noise improv, video art while also working with dance, theatre, moving images and interdisciplinary contexts. In the midst of this eclecticism, his artistic concerns remain constant: the balance between the cerebral and the sensual, and between organic sound sources and digital processing. His works has been noticed at Prix Ars Electronica (Austria), SONAR (Spain), Elektra and Mutek (Canada), DotMov Festival (Japan), ZKM (Germany), Transmediale (Germany) and have been published on labels like Crónica (Portugal), Ahornfelder (Germany), leerraum (Switzerland) and Home Normal (UK). He is currently a PhD candidate in sonic arts at the University of Huddersfield (UK) under the direction of Dr. Pierre Alexandre Tremblay and Dr. Monty Adkins. He is a member of “Perte de signal”, a media arts research and development centre based in Montreal.